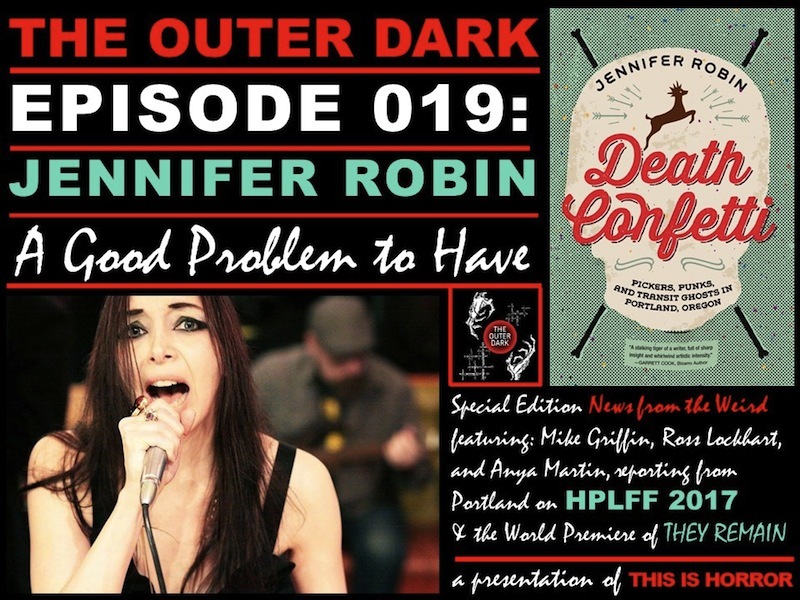 The new The Outer Dark includes an interview with Jennifer Robin, and a special edition of News From the Weird in which host Scott Nicolay interviews a few of us (me, Anya Martin and Ross E. Lockhart) after the end of HPLFF 2017. Tomorrow our guests arrive for the H.P. Lovecraft Film Festival, and Friday the events get underway! The full schedule is available in PDF format HERE. Here’s my portion of the schedule, including “note to self” times for when the doors open each day, dinner breaks, and events I’m part of, as well as the screening of They Remain I want to see on Sunday. I’ll have to miss the Saturday world premiere of They Remain in the big theater downstairs because it conflicts with my reading, but as long as I get to catch it the next night, I’m happy. This event is always really enjoyable, and a great opportunity to see friends and interact with weirdos. We have four people from out of town staying at our house, so it should be a fun four-night slumber party as well! I can hardly believe the 2016 Portland HP Lovecraft Film Fest begins this evening! Actually, regular events don’t start until tomorrow, but tonight is the VIP Party at Lan Su Chinese Garden, for Guests and people who pledged the Kickstarter at the VIP level. I’m doing the “Weird Tales: Beyond H.P. Lovecraft” panel Saturday at 10PM with Ross Lockhart (moderator),, Anya Martin, Ed Morris and Wendy Wagner. Scott Nicolay is also on the schedule but I understand he had to cancel at won’t be at HPLFF this year. Last I heard, Peter Rawlik was going to have to miss the festival as well, because of the hurricane approaching Florida, where he lives. If so, either Cody and I will both read extra long, or we’ll see if the organizers add a new 3rd reader. I’m also taking part in the group signing Saturday at 10AM, and will be glad to sign books. I assume Ross E. Lockhart will have copies of The Lure of Devouring Light for sale, along with Eternal Frankenstein which will make its debut at HPLFF, and the rest of the excellent Word Horde catalog. This is always one of my favorite events of the year, another installment of the first convention I ever attended, the first convention at which I was a guest, or did an author reading. This will be a little unusual, in that Lena and I usually try to host a few con guests at our home, but because we’re putting the house up on the market, the place is empty and ready to sell, so we won’t have any of the usual weirdos traveling with us. If you’re there, I look forward to seeing you again, or meeting you for the first time. Don’t hesitate to say hello, especially if we’re online friends but I might not recognize you in person! For those of you who won’t be in attendance, I’ll try to post lots of pictures and give updates of all the events, as much as possible. The Kickstarter for this year’s Portland H.P. Lovecraft Film Festival ends tonight, so now’s your chance. I’ll be a guest at the festival again, and taking part in the VIP Party at Lan Su Chinese Gardens, and the Shanghai Tunnels tour. I’m also one of the contributors to the Challenge From Beyond 2016 book, which includes a round robin story as well as another story by Peter Rawlik. This is the cover of the book, illustrated by Shelby Denham. The 21st Annual H. P. Lovecraft Film Festival® will feature independent short and feature films, plus featured guests Stuart Gordon (director of Re-Animator and From Beyond), author John Shirley, and many more! Deluxe and VIP Ticket packages available now in our Kickstarter at http://kickcthulhu.com/ Regular tickets will go on sale around September 10th. The Lovecraft Film Fest is a lot of fun every year, so if you’ve never attended before and you’re considering it for the first time, I really think you should. Even if you’re not the world’s biggest Lovecraft fan, and care more about horror or weird fiction in general, you’ll find a lot to enjoy here. Films, panels, readings and more. Hope to see you there! One of my favorite events every year is the Portland H.P. Lovecraft Film Festival, the next installment of which happens October 7-9, 2016. This year I also visited the San Pedro, California version for the occasion of my book release, and they’re also doing a Providence, Rhode Island version which just happened this past weekend. The Portland event is the biggest of the three, and the original. While I was busy with other things this weekend, I neglected to post about the new Kickstarter for the Portland HPLFF. It looks like it won’t have a lot of trouble meeting its goal… in fact, literally as I type this sentence, it just watched it click over the $15k mark in another browser window. Congratulations, Gwen and Brian Callahan – funded! Now, just because they’ve reached their goal doesn’t mean you won’t want to pledge. This is the best way to get your package of tickets, t-shirts, art and other goodies related to the event. I’ll be a guest again this year, and for the first time I’m participating in a fiction round robin, a collaborative story written along with John Shirley, S.P. Miskowski, Nikki Guerlain, Andrew S. Fuller, Wendy Wagner and Aaron Besson. If you want to read that story in the souvenir book, it’s a $10 add-on to any other pledge level. Even if you won’t be able to attend, you can support the event and get some cool stuff. There are several packages available for non-attendees, allowing you to obtain various souvenirs just as if you were going to attend. I assume there will be some cool stretch goals, as there have been in the past. Who knows what kind of interesting special guests might be on the horizon?